So they’re not really a secret, but they’re new to us and our quest to have a great garden. 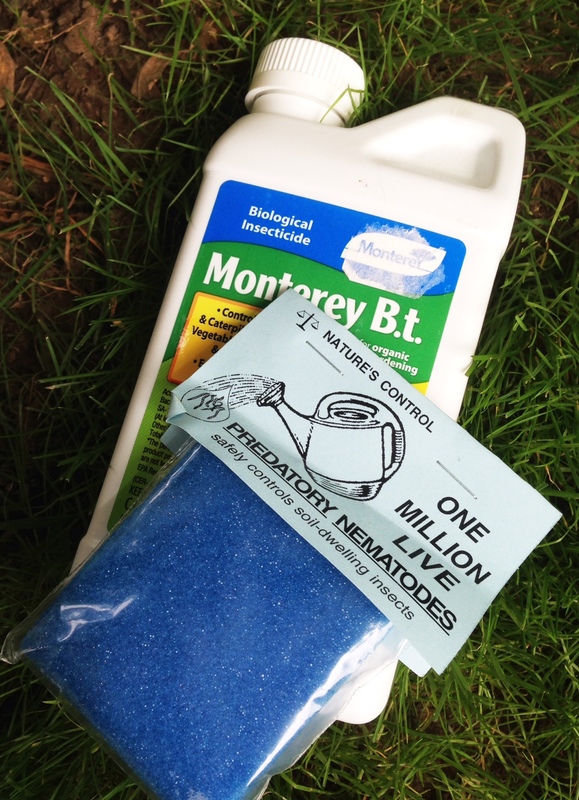 First up, beneficial nematodes. I never heard of these until we stopped by Worm’s Way to buy our compost bin last year. We told the incredibly knowledgeable worker about all our problems and it was her suggestion. The store’s blog has an in-depth explanation of all sorts of beneficial insects. The basic idea is these microscopic nematodes seek out and destroy all soil dwelling pests, but they’re not harmful to earthworms or other good creatures in the garden. There are about one million in a sponge about the size of your palm. You cut what you need, drop the sponge into a watering can (what we used) or a sprayer and pour them into the dirt. Our attack plan for a whole array of garden pests. Second, we’re using Bt. It’s a naturally occurring bacteria that kills caterpillars who feast on the leaves of the vegetables. It’s kind of gross what actually happens, but apparently once they eat the leaf with the Bt, the bacteria multiplies in their stomach and they die. It can also be injected into stems to protect from the squash vine borer. We’re going to mix some and spray it on the leaves but aren’t sure if we’ll go the injection route. We’re hoping the nematodes will eat any vine borer larvae before it hatches into the wasp and lays its eggs. I’m really excited to see how these work and will report back later in the season.